In this video, we are going to look at how to solve a system of equations using substitution – linear and quadratic. These are solved similarly to how we would normally solve any other system of equations. Therefore, (0,-2) and (-2,-6) are the solutions to this system of equations. 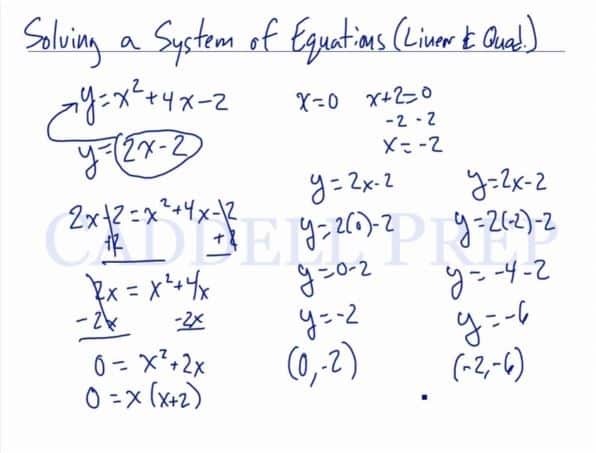 Let’s go over solving a system of equations algebraically for linear and quadratic functions. This is very similar to how you solve a system of equations except we have a variable raised to the second power. Now, let’s substitute one expression to the value of the other equation. In this case, let’s get the second equation and substitute it in the first equation. Like normal, we’ll have one side of it to be equal zero. There’s no -term so we’re going to factor this. Now, we have two factors which is each equal to zero. Now, let’s solve for the value of by substituting the value of in one of the equations. Here, our answer is . Let’s try another system of equations. Same thing, let’s substitute the first equation as the value of in the second equation. Same strategy. Get one side to be zero. Now, let’s substitute the values of to get the value of . Let’s use the first equation.